West Baraboo is a village in Sauk County, Wisconsin, along the Baraboo River. In 1956, West Baraboo was incorporated as a village; prior to the incorporation the village was part of the Town of Baraboo. The population was 1,414 at the 2010 census. Some of the businesses located in West Baraboo include: Festival Foods, Walgreen’s, Kwik Trip, Wild Bird Barn, Clarion Hotel/Glacier Rock Restaurant and Convention Center, Best Western/Bonzos, Culver’s, McDonald’s, Pizza Hut, Subway, First Weber Realtors, several banks, two convenience stores, 2 beauty salons, Hill’s Wiring, Senger Lumber, Dean Blum Excavating, Hill-Dale Veterinary Hospital and Kobussen Buses to name a few. The Village offers two wonderful parks for the enjoyment and recreation for residents and visitors of all ages. Contact village hall at 608-356-2516 to reserve one of the shelters. Amenities: Shelter with electricity and restrooms, volleyball court, horseshoe pit, playground, gazebo and a pier/boat launch that offers accessibility for disabled visitors. 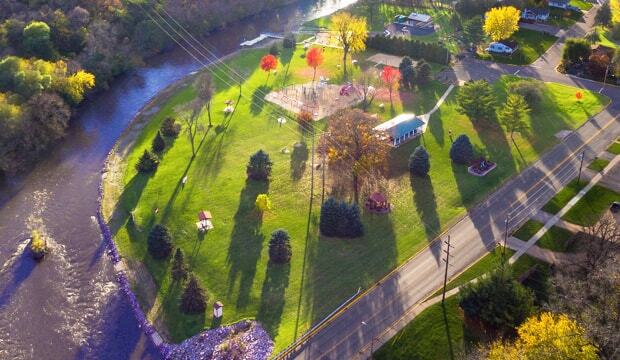 Perfectly located on the Baraboo River with abundant fishing opportunities and fun for the entire family. Amenities: Shelter with electric, restrooms and a playground. The creation of the digital files by the Baraboo Public Library for Baraboo 1850-2010: Chronology of the Growth of the Commercial & Retail Districts was supported in part by a grant from the Wisconsin Arts Board with funds from the State of Wisconsin and the National Endowment for the Arts. Additional support was received from the Sauk County UW-Extension, Arts and Culture Committee. The copyright of the digital files is held by Joseph Ward and the files on this website are used by permission of the author. This electronic edition is for non-commercial personal use and research. Any other use of this information will require the written permission of the copyright holder.